FREE first class flight upgrade! Book your honeymoon or destination wedding package that includes flight and hotel stay at Real Resorts in Cancun and Riviera Maya by August 13, 2012 (travel by February 28, 2013) and receive a flight upgrade to first class ! Friends and Family — Choose a destination wedding and your guests will save up to $200 per booking to attend your wedding! Plus you, the couple, will receive a rebate up the the cost of your wedding package. Honeymoon amenities — If you choose a honeymoon, honeymoon amenities will be applied to your booking (bottle of sparkling wine, special flower petal suite with decorations and more). Exclusive All-Inclusive PLUS — These resorts offer extra amenities at no extra cost including unlimited a la carte dining, upgrade in-suite amenities, and more. The preferred gold pick location also earns 3,000 bonus miles per person through SkyMiles® when booking a flight and hotel package. Real Resorts include 2 distinct brands: THE ROYAL and Gran Real Resorts. THE ROYAL Cancun and THE ROYAL Playa del Carmen provide luxurious, all-inclusive, all-suite, adults-only accommodations, with services that are a perfect fit for high-end travelers looking for refined sophistication. In 2009, 2010, and 2011, both hotels won the prestigious International Star Diamond Award from the American Academy of Hospitality Sciences. THE ROYAL Cancun and THE ROYAL Playa del Carmen each offer expansive beach areas and unexpected amenities that repeatedly surprise and delight guests. Gran Caribe Real Resort & Spa, complete with splash pad, pirate ship, and waterslides. Plus, both properties offer spacious Family Junior Suites, which can accommodate up to 5 people—2 adults and 3 children or teens. LAST CHANCE :: Family Fun in the Sun Specials! 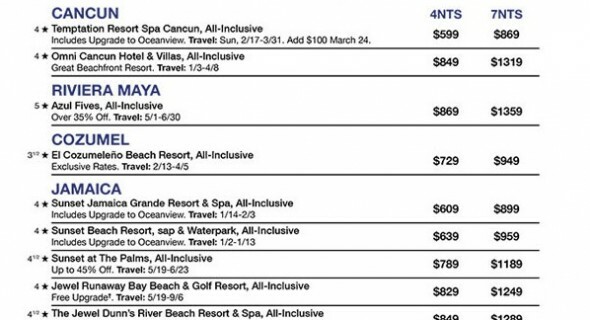 INCLUDES 3 nights, Grand Oasis Cancun, all-inclusive & hotel transfers. BONUS 2 kids 12 & under stay & eat free. Airfare Additional. INCLUDES 3 nights, RIU Playacar, all-inclusive & hotel transfers. BONUS save up to 26%, $35 massage credit per person, golf savings & 2 kids 12 & under stay free. Plus stay at 1, play at 3. Airfare Additional. 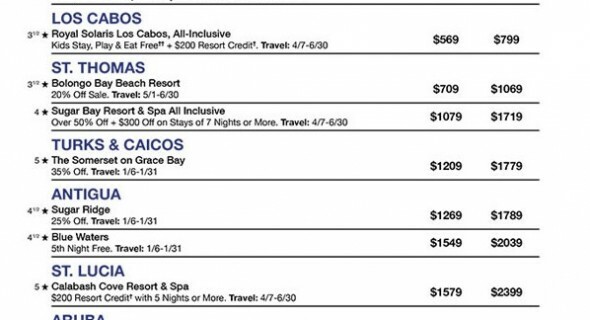 INCLUDES 4 nights, Rio Mar Beach Resort & Spa, A Wyndham Grand Resort & hotel transfers. BONUS save 40%, $100 food & beverage credit & kids 12 & under stay & eat free. Plus save 25% on golf, spa, tours & more. Airfare Additional. INCLUDES 4 nights, Holiday Inn Hotel & Suites. BONUS kids 12 & under stay & eat free from the kid’s menu. ADD 4-Day Disneyland® resort hopper ticket from $242. * Airfare Additional. INCLUDES 3 nights at Disney’s All-Star Music Resort and complimentary airport transfers. BONUS save up to 15%. PLUS kids 17 & under stay free. 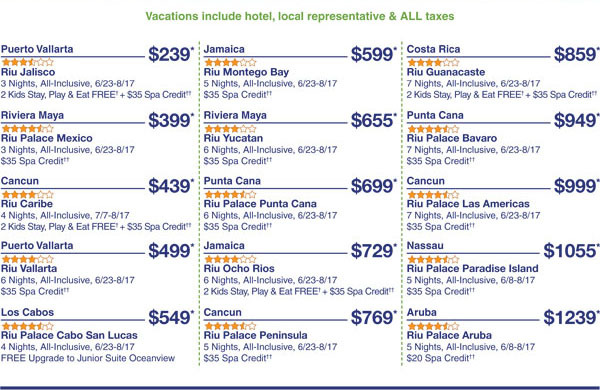 Valid for travel 6/15-8/14/12. Book by 6/14/12. ADD 4-Day Walt Disney World® Theme Park Tickets from $265. * Airfare additional. INCLUDES 4 nights, Buena Vista Suites. FEATURES shuttle to Walt Disney World®, SeaWorld® & Universal Orlando® theme parks. EXCLUSIVE $50 food & beverage credit. BONUS buffet breakfast for 2 daily & kids 13 & under stay free. ADD 4-DAY Walt Disney World® Theme Park Ticket from $265. Airfare Additional. INCLUDES 3 nights, The Westin Diplomat Resort & Spa. EXCLUSIVE room upgrade. BONUS Kids 17 & under stay free. Airfare Additional.